Duck tours are operated in major cities around the world; tourists are transported in an amphibious vehicle that can drive on city streets while also functioning as a boat. They are popular in cities with lakes or rivers near other popular tourist attractions. The original model for Duck Tour boats were military surplus amphibious vehicles; due to the popularity of duck tours, some vehicles are now purpose-built for touring. The first company calling its tour offerings “duck tours” began operating in the 1940s. As fleets aged and more duck tours hit the road, accidents increased. Since then, there have been numerous serious and fatal accidents that have resulted in a number of personal injury and wrongful death lawsuits filed against the company alleging negligence. Hot Springs, Arkansas: A military surplus DUKW vehicle sunk while on tour on Lake Hamilton. 13 of the 20 people on board, including three young children, lost their lives. Passengers were not wearing life preservers. The boat took on water rapidly and submerged within a few minutes. Ontario, Canada: A custom-build vehicle called the Lady Duck sunk in the Ottowa River while on a tour. Four passengers were trapped under the Lady Duck’s canopy and drowned; six passengers, the tour guide, and the driver escaped. Philadelphia, Pennsylvania: An amphibious bus was disabled in the water by an engine fire. A tugboat operator was distracted by his cell phone while pushing a barge; the barge struck the disabled duck boat, killing two passengers from Hungary. Thirty-three other passengers and two crew members survived. Liverpool, UK: A bearing collapsed on a vehicle belonging to a tour company called The Yellow Duckmarine, causing the vehicle to crash on Duke Street. Four passengers were taken to the hospital with injuries. Seattle, Washington: A Ride the Ducks vehicle rear-ended a passenger vehicle at Third Avenue and Pike Street. No injuries were reported. The driver told police that it was impossible to see the car before hitting it. Seattle, Washington: A motorcyclist was seriously injured after a Ride the Ducks boat ran over him. He was stopped at a red light when the larger vehicle came up behind him. His arm, leg, and pelvis were crushed, and he was dragged into the next block while he was stuck beneath the undercarriage. Seattle, Washington: A Ride the Ducks boat rear-ended a car at Aurora Avenue North and Denny Way. No injuries were reported. Once again, the driver told police that the height of the Duck boat made it impossible to see the car directly ahead. Liverpool, UK: The Yellow Duckmarine tour company made the news in March when one of its vehicles sank near Salthouse Dock. The Marine Accident Investigation Branch released a report on the sunken vehicle, finding that “Its hull was heavily corroded and was covered with a patchwork of unapproved substandard repairs, it was mechanically unreliable, and regularly failed to climb out of the dock. The vessel was not seaworthy and it should not have been operating on the water.” Survivors reported that although they had been provided with life jackets, they were difficult to remove from their packets. London, UK: Passengers were forced to jump overboard after a duck boat caught fire on the River Thames. Once again, survivors reported that it was difficult to remove the life jackets they were given from their protective packets. Investigators found that the cause of the fire was faulty buoyancy foam. Philadelphia, Pennsylvania: A duck boat struck and killed a 68-year-old woman who was crossing the street in Chinatown. Witnesses said that the woman was distracted by an iPad while crossing the street, but safety advocates pointed out that the bow of the boat created a blind spot that made it difficult for the driver to see a pedestrian directly in front of the vehicle. Seattle, Washington: A pedestrian was struck by a Ride the Ducks vehicle while crossing the street. He suffered minor injuries. According to police, he was crossing against the light. Seattle, Washington: 5 people were killed, eight were critically injured, and eight were seriously injured after a Ride the Ducks vehicle veered out of its lane on the narrow Aurora bridge and struck a bus carrying international college students on a tour of the city. An investigation found that the front axle of the boat had sheared off, and that the company operating the boats had over 400 safety violations in addition to requiring its drivers to simultaneously entertain passengers and operate the unwieldy vehicles on city streets. Boston, Massachusetts: A woman died when her moped was hit by a Duck Boat making a turn onto Beacon Street. She went under the vehicle and ended up beneath it. Her boyfriend, who was riding on the same moped, was injured but survived the crash. 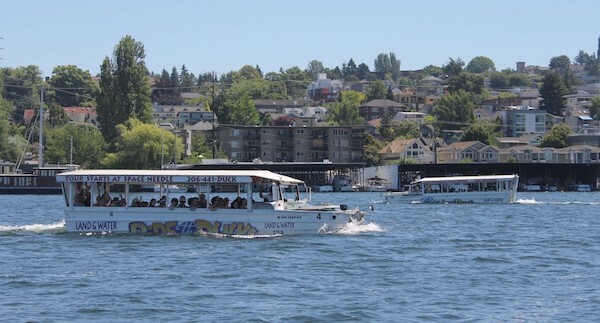 Seattle, Washington: A boat operated by Ride the Ducks crashed into a car. A witness said that the driver of the Ducks vehicle apparently did not see the car while making a wide turn. No injuries were reported. Seattle, Washington: A Ride the Ducks vehicle rear-ended a small sedan, crunching the car’s truck. According to a witness, the driver was trying to get out of the way of an oncoming ambulance and could not see the sedan in front of it. Branson, Missouri: A tourist duck boat capsized in a lake, killing 17 people, including children, as severe thunderstorms struck the area. Additionally, seven were badly injured and four others remain missing. If you know a pedestrian or motorist that was seriously injured or killed in a duck boat accident, it is important that their family retain an experienced duck boat accident attorney. A wrongful death lawyer will have experience litigating complex deadly motor vehicle collisions. For a free case evaluation and consultation with the award-winning attorneys at Davis Law Group, P.S., call our office in downtown Seattle at (206) 727-4000. I worked for Boston Duck Tours. Safety is not the top priority.. Fun 1st, then money. Cindy hired that man with a faulty driving record. She desperately needed a Black person.